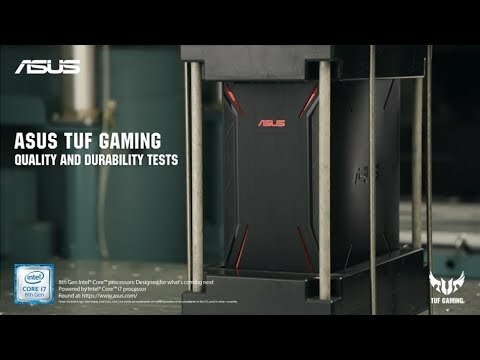 Unstoppable Gaming FirePowerThe ASUS TUF Gaming FX505 is an unrivalled laptop designed for gamers and engineered for intense gaming, which provides an extended lifespan that goes above and beyond. The FX505 features a keyboard inspired by desktop keyboards and includes LED backlit keys, highlighted WASD key group and Overstroke technology for ultra-fast precise control. Along with a stunning 15.6" Full HD display and immersive DTS Surround Sound, your gameplay will be impeccable. ASUS TUF laptops are solidly built for excellent durability. Featuring Anti-Dust tunnels which expel dirt and dust from the chassis to preserve performance and longevity. Equipped with Intel Core i7 to play the latest games and multitask with ease wherever you are, for years to come. 8th Gen Intel Processor, NVIDIA Geforce 1060 Power.The FX505 provides a full gaming desktop experience despite its compact form factor. It’s suited with an 8th Generation Intel Core i7-8750H 6 core processor featuring a turbo speed of up to 4.1GHz and a NVIDIA GeForce GTX 1060 graphics, both work together to bring you a more powerful, rich, faster experience for multiple tasks such as gaming, recording and live-streaming. EXTREME IMMERSION ON AN ULTRA-FAST DISPLAY With a 6.5mm bezel the NanoEdge design brings extreme immersion in a compact laptop. The FX505 features an IPS-Level panel with a fast 144Hz refresh rate for super smooth gameplay. Another feature is the 100% colour gamut giving you vivid and consistent colours, its superior wide-view angles allow you to see more from extreme positions. Fast Gaming and Multitasking Compared to a computer with a standard HDD, a SSD hard drive gives you the power to boot, access storage, launch, and get things done at maximum speed. A system with a SSD hard drive provides fast responsiveness to frequently used files and applications while the HDD hard drive gives you the capacity for larger files such as film and game libraries. HYPERCOOL TECHNOLOGY IMPROVES DURABILITY You can be sure that your FX505 keeps cool with the ASUS-exclusive Hypercool Technology which incorporates an Anti-Dust Cooling system, mixing that with the Fan Overboost technology you can expect to see exceptional cooling. And with the patented trapezoid-cut lid and intelligent parallel fan placement for even more cooling you know that your laptop will perform at its best. 7.1 HIGH-FIDELITY AUDIO Experience high-fidelity 7.1 virtual surround sound, this is thanks to the DTS Headphone: X technology as it optimizes and delivers immersive games, sports, and movies and allows for additional fine-tuning with its built in-equalizer. pushed to the limit The FX505 passes a series of rigorous MIL-STD-810G tests, it has survived extreme conditions from solar radiation exposure, high altitude, and various temperatures. Durable and stable the FX705 has been pushed to the limit for gamers so that it is certified to endure day-to-day use which could include accidental knocks and sudden drops on the desk. FASTER SPEEDS, WIDER COVERAGE With the latest 802.11ac Intel Wi-Fi Card the FX505 boasts data transfer rates of up to an incredible 1.7Gbps, 12X faster than the baseline standard. Additionally, you can gain a 30% wider coverage with the 2x2 MIMO configuration, this alongside the superfast speeds allow you to stream your favourite movies in high-resolution or play online with fewer connection drops, even if the FX505 is far away from your router. Precise keystrokes with HyperStrike Technology Optimized for gaming, the Desktop Inspired Keyboard with backlit LEDs has exclusive HyperStrike technology that ensures more accurate typing and improved ergonomics. It includes a highlighted WASD key group, broader space bar, isolated arrow keys, and recognizable gaps between the function keys. Working with that the Overstroke technology registers keystrokes faster and more precise so that you are always in control. Connectivity within reach The FX505 features a host of I/O Ports including a single USB 2.0 and two USB 3.1 ports for your gaming peripherals, as well as HDMI 2.0 to connect to an external display. All ports are situated on the left side of the laptop so there’s nothing to interfere with right handed gaming. Gaming on PCs used to be restricted to desktop computers equipped with a dedicated graphics card connected to a display, much in the same way that a games console works with a TV. Recent advances in technology have enabled manufacturers to equip laptops with increasing levels of graphics power without them being too bulky or heavy. NVIDIA refreshed its range of graphics cards recently with the introduction of a number of new models for performance desktop PCs. Four new GeForces have been released in quick succession. The Titan X, GTX 1080, GTX 1070 and GTX 1060, all based on the new, efficient Pascal architecture, have set new levels of performance in each segment.